If you’ve spent any time on Facebook or Twitter this month, your feed is clogged with cat photos, political outrage, and one more thing that’s equally insidious. #30daysofgratitude is all the rage. People say what they’re grateful for. Ad nauseum. The SEC is pro-Thanksgiving. That’s why we’re going to eat a big feast on Thanksgiving Day. More important, it’s why we celebrate the Eucharist, with its Great Thanksgiving, every Sunday. But a whole month of unicorns and puppies is a bit much. So we’ve decided to offer a counterpoint. #Lentitude. Today is One Day of #Lentitude. Here’s our invitation. Go with Jesus into the wilderness. It’s no party. It’s full of things to make a person grumpy: weeds, sand, heat, scorpions, and a lack of espresso bars. Today only, we invite you — all day long — to share the things that make you grumpy or that annoy you. Give something up! Do Lent stuff today! Here’s a suggestion list. Naturally, it’s a list of Ten Ways to Do #Lentitude. 10. Give something up for a day. 9. Say the Stations of the Cross at church or at your local coffee place. 8. “Reconcile” with someone by telling them the ways in which they annoy you. 6. Wander in the wilderness for 40 minutes (hey, you only have one day). 5. Call your local radio station and ask them to play the Lent Madness Theme Song instead of the Christmas music they probably have on. 4. Eat twigs. With garlic. 3. Every time someone says, “How are you?” tell them about every problem you have, have ever had, or might ever have. 2. Email everyone in your address book your favorite Lent hymn texts. Send several in separate messages. 1. Post #Lentitude at least 40 times on your social media. That means 40 different ways in which you suffer. In so doing, all your friends will suffer too. #Lentitude is the gift that keeps on giving. Enjoy #Lentitude! But not too much, because enjoyment is for Easter and sparkle ponies only. 17 Comments to "One Day of #Lentitude"
And I think it’s a little early for Lentitude….. although I can find 40 minutes to walk in the wilderness (aka park). Please keep us on this good path. You cannot know how much it helps no matter where we are. Thank you! Please tell Jay I know his sister who is also a talented artist!!! Lentitude! I like it! you may be getting a little pissy though; the world will never be what you want. Body brands you a spoil sport. Was Jesus a spoil sport?) I digress . Keep thinking up cool things to do. Well wouldn’t you just know it, I am wearing one of my purple t-shirts as I type this! 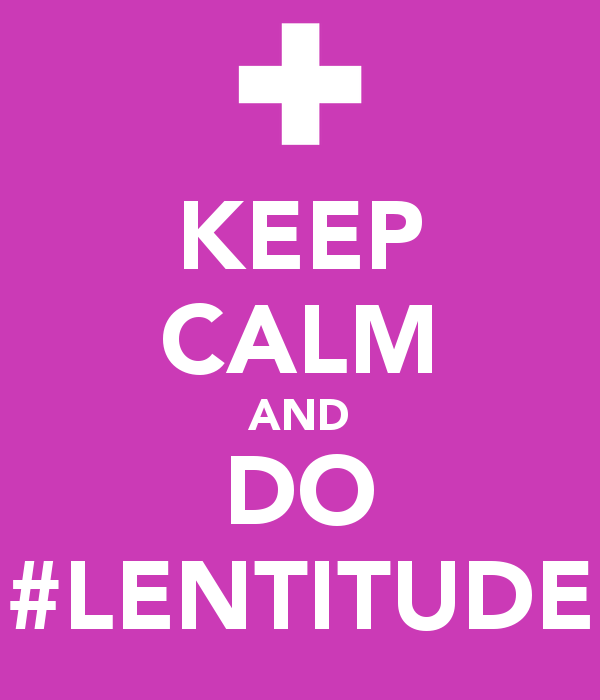 Lentitude is an excellent idea! However: your post contains two things that are extremely annoying. First, the transmogrification of the singular – someone, a person, et al – into the plural – they, them. Keep it all singular, or all plural, e.g., people instead of person in the subject. Second is that blasted, meaningless, trendy #. Dear Supreme Committee–I do love the concept of Lentitude, but what about Adventitude? Yes, Advent also has a penitential quality about it, but different–and more corporate–than Lent. We are preparing for the “comings” of Christ–past, present and future–and that involves some soul searching and also a sense of humor and grace about ourselves and others. So, as you say, Carry On and Keep Lentitude! And I completely agree with the need for Adventitude — *when* it is Advent. Thankful for my wonderful job. I am truly grateful. I’m ahead of the game for once. I’ve already done #8 to ticked off folk…as if it matters, and #7 as I always wear purple on Thursdays just because and #3 to anyone within earshot….why do they keep running away? I do love Lentitude because I suffered evening Lenten prayer services as a child kneeling on hard wooden floors in Miss Minnie’s living room and getting pinched by my loving (?) mother if I thought about groaning in pain. Go SEC !!!!! Why don’t you keep Orthodox Advent and be done with it. Where is Grumpy Orthodox Cat when you need him? IOS7. Need I say more? I love #Lentitude! The SEC is fabulous! You make my day!